Our outlook remains constructive on equities until the end of the year despite Government Shutdown and and Debt Ceiling concerns that is due to be fixed before 17-Oct-13. 1. Technicals. SPX is bullish technically and is forming a falling broadening wedge pattern in the 1Y daily chart w/c suggests a continuation of the upside move in the short-term. This bullish outlook will be invalidated if the price breaks the Support of the rising wedge w/c will then turn the technicals bearish. A potential driver of this event happening is when the policy makers in the US don't come up with a deal before 17-Oct-13 to raise it's debt ceiling. However we'd take the opposite bet on this because given that they "own" the decision whether they will default or not and given that the whole world is looking at them the probability that they will decide not to default is higher. - An event of default is a very BIG thing for the credit markets, because if the US were to default on it's debt obligations Yields of the US treasury should have gotten up to compensate for the credit risk of holding the instrument. However despite this, US Yields remained flat. W/c implies that US will not default. - US credit spread barely move before and after the government shutdown. Only the 1M expiring debt yield increased w/c implies that the fear of the market is only in the very short term. - The TED spread w/c is a measure of counter-party credit risk among the Bulge Bracket banks even tightened during the shutdown w/c means that the risk of a counter-party default actually came down. 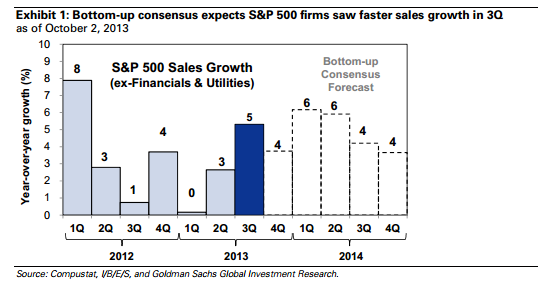 - We are expecting the 3Q earnings to be upbeat given that historically 2H earnings tend to be higher than 1H. 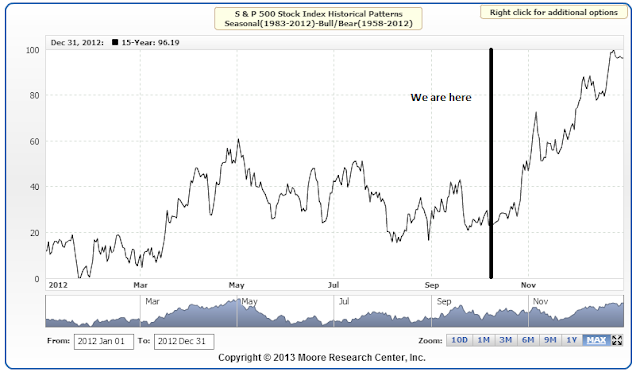 This is in line with GS outlook of w/c we agree. - Seasonaly, the SPX tend to go up from Oct to Dec.
1. A lot of people working in the Government got laid of - w/c means more people are unemployed. 2. A lengthy government shutdown could paralyse US Federal Reserve policy making – including a crucial decision on when to slow its asset purchases – and create ripple effects that make economic data less useful for months or even years to come. 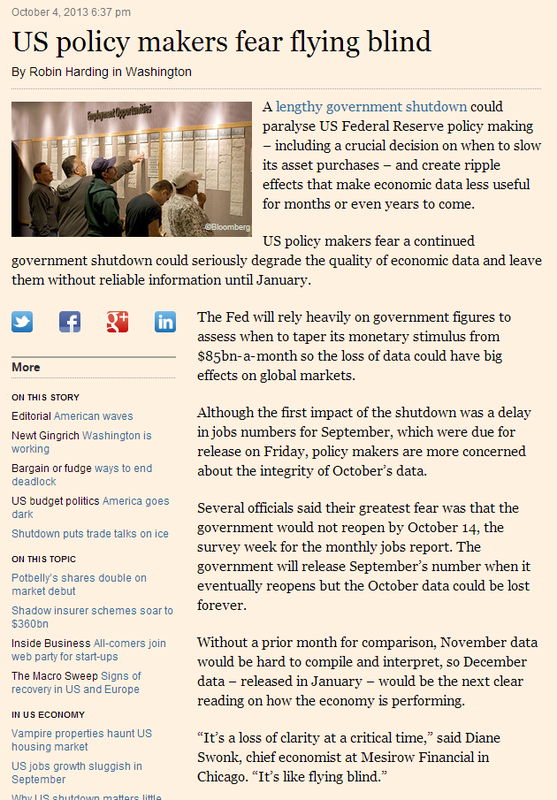 US policy makers fear a continued government shutdown could seriously degrade the quality of economic data and leave them without reliable information until January. 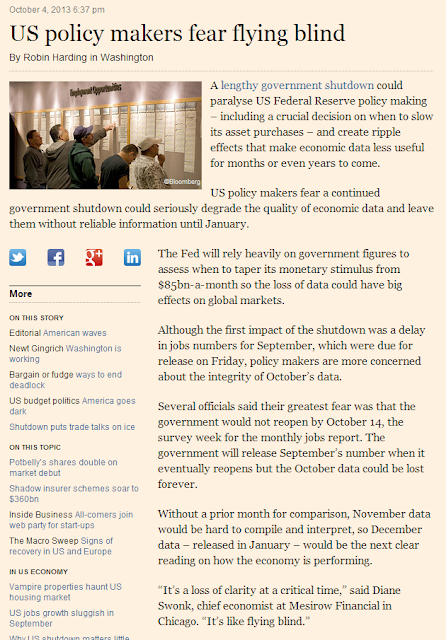 In short, there is an incentive not to taper because the Govt shutdown could potentially degrade the quality of economic data. Caveat: However despite all this, we could still be wrong and the market could still drop, having this said we are still open on shorting the SPX provided that technicals and risk-reward is compelling.